After moving a piece of furniture after years of resting, whether off a carpeted floor or a fibrous rug, there will be permanent-looking notches beneath its feet. These indents are more than unattractive, as they can become early signs of wear and tear, unless fixed before damage is done. YouTube user WesleyGW offers a tip that can make indents like these disappear in a matter of an hour or so (skip ahead to 0:27 for the how-to). Place an ice cube atop the indented carpet fibers and let it melt. As she points out in the video, you may need to wait a bit. Once your ice cube has turned into a puddle of wet carpet, use your fingertip to fluff up the fibers, getting them upright and indent-free yet again. Others, such as Heloise of Housekeeping and Jana Randall of http://[www.sheknows.com/home-and-gardening/articles/966667/how-to-get-furniture-indentations-out-of-carpet SheKnows, suggest tools that can help you fluff up those carpet indentations once the ice has melted. You can use a spoon, or even a coin, to draw the fibers upright and back into place. Though this tip is an oft-recommended one online, its source stems from steam cleaning matted, dirty carpets. By getting the carpet wet as the ice cube melts, the fibers expand in response as they soak up the new influx of water. While your heavy furniture placed a lot of pressure on these fluffy fibers, the water from a melted ice cube adds the girth that disappeared as the carpet sat beneath your couch for a year or two. Also, since carpets have a slow absorption rate, simply spraying the grooves with water will create more puddles in the surrounding areas than necessary. 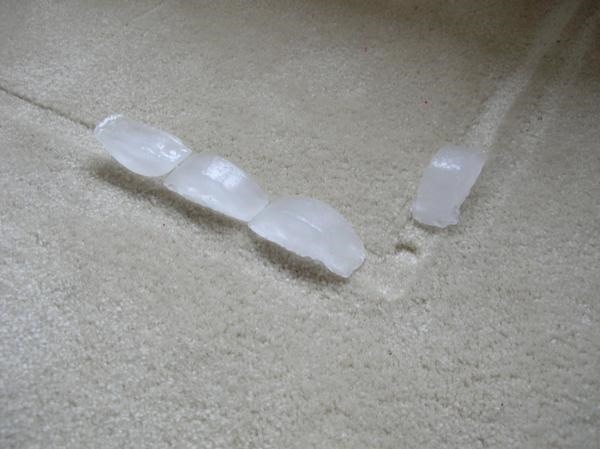 An ice cube melts at the perfect rate for the carpet fibers to soak up all of its watery goodness without soaking other parts of the carpet in the process. As the damp carpet dries, it will retain this nice, fluffy state, "growing" in a sense to fill the indentation that was once present. Basically, this ice cube hack expands those condenses fibers, bringing them back to their original size. If you're simply rearranging your furniture, or prepping your place for new owners, this ice cube hack can get carpet looking its best, with no signs of any previous weight. Now, if you need to get rid of a stain on your carpet, ice cubes won't help you there, but a clothes iron will.